There's a certain Hebrew kinship term that I've been putting off writing about because it's rather complicated. So I thought I'd write about saba סבא - "grandfather" and savta סבתא - "grandmother" instead, because they seemed much simpler. As often happens, I greatly underestimated the complexity of these "simple" words. The names saba and sabta are permitted for use as terms of affection, and the letter bet is accented [not sure what this part means - any ideas?] due to the similar sound of the word abba. השמות סַבָּא, סָבְתָא (בי"ת בלא דגש) מותרים גם בשימוש כללי ולא רק ככינויי חיבה. which justifies the general usage of the words, and allows the common pronunciation savta, where the bet does not have an accent. It is a word created by the little children in Israel, following closely the word "abba". The children were told to call this relative סב (sav) but it was simply much easier for them to link both these older loving male adults with these two similar sounding names, אבא (abba) and סבא (saba). However, Ben Yehuda, in his dictionary which was written not long before, does not list sav, saba, sava or savta as meaning grandfather or grandmother. I don't have the ability to do a full text search through the entire 17 volume dictionary (but wouldn't that be amazing?). However, I did see that one of his definitions for zaken זקן is "grandfather", so perhaps that was his preferred word. A general term for the grandfather and the grandmother; the name horim savim is preferable to horim zekenim הורים זקנים because the later is likely to confuse people who will think that it refers to the age of the parents. Both zaken and sav mean "old". Sav is originally Aramaic, and corresponds to the Biblical Hebrew sav שב. This word is closely related to the word seiva שיבה - meaning "old age" and "grey hair". But in these biblical mentions (Iyov 16:10, Melachim I 14:4) it doesn't mean grandfather - only "old person". In fact, I couldn't find one example in the entire Tanach where a word was used to refer to "grandfather"! I find this very surprising. I know we've seen an example before of a Biblical Hebrew word that didn't make it into the Bible, but I figured that grandfather would be a much more common word. As far as Talmudic Hebrew, Jastrow has sav and sava as "grey, old; elder; ancestor; scholar". He does have one mention of savta as grandmother - Bava Batra 125b. His third definition of zaken is "grandfather, ancestor", although his example is of the word being used as an ancestor, not a literal grandfather. Neither Ben-Yehuda nor Even-Shoshan bring Talmudic examples of sava meaning "grandfather". However, in the course of researching this post, I did find a few examples where sava clearly meant grandfather: Ketubot 72b, Yevamot 38a and 40b. (I also found a few examples of zaken, as well as avi av אבי אב - "father's father".) 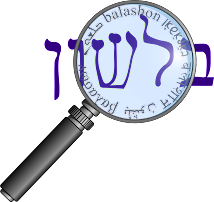 Here too, the ability to perform a comprehensive search of all Hebrew literature would help determine what names were used when for grandfather and grandmother.